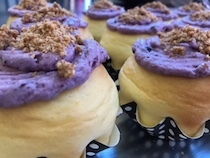 Memories of home made pies come to mind when you bite into the lush blueberry filling. 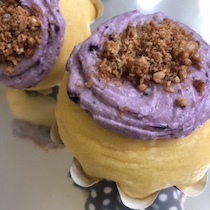 The cream cheese frosting is also generously infused with blueberry richness, and topped off with a generous dusting of honeyed granola morsels. You won't be able to resist the urge to return for seconds!